In addition to the Dean’s Office and Department achievements, explore this edition’s list of Accolades for the following: Faculty/Staff; Alumni; Students, as well as In Memoriam. The Neag School has announced the winners of its 2019 Alumni Awards: Victoria M. Schilling ’16 (ED), ’17 MA; Deidra Fogarty ’05 (ED), ’06 MA; Maureen F. Ruby ’77 (CLAS), ’78 MS, ’82 DMD, ’07 Ph.D.; Craig A. Cooke ’01 6th Year, ’07 Ph.D., ’08 ELP; Rachel R. McAnallen ’10 Ph.D.; D. Betsy McCoach ’01 MA, ’02 6th Year, ’03 Ph.D.; and Carla S. Klein ’72 (ED). Awardees will be celebrated at a celebration in March. Read more and register for the event. The Neag School has issued to education leaders nationwide its 2017-18 By the Numbers Report, offering a high-level glimpse into the School’s current rankings, research expenditures, global education efforts, scholarship support, and other highlights. The report also pays tribute to Ray Neag, who passed away last spring. The Neag School recognized James Kaufman as the 2018 Neag School Distinguished Scholar and Allison Lombardi as the 2018 Neag School Early Career Scholar. They were commended at the December faculty-staff meeting on the UConn Storrs campus. 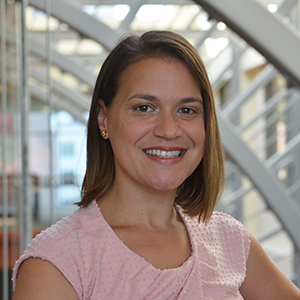 Allison Lombardi, associate professor of educational psychology, received the Neag School’s 2018 Early Career Scholar Award. 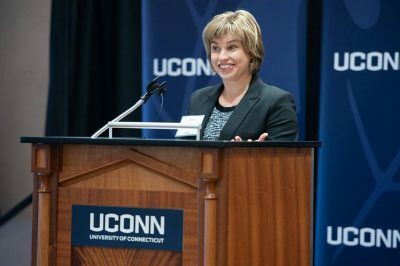 UConn has accepted an invitation to become part of the BOLD Women’s Leadership Network. The BOLD program seeks to equip young women at select universities nationwide to be innovative agents of change during their college careers and after they complete their studies. 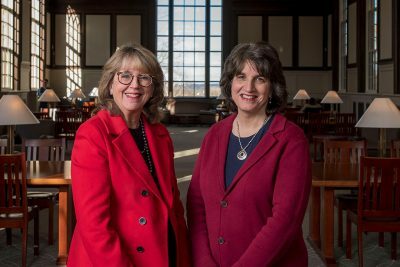 With Board of Trustees Distinguished Professor Sally Reis serving as co-leader of the initiative, the funding will be housed in the Neag School. The Neag School was a co-sponsor of InCHIP’s final Fall 2018 lecture, featuring Lisa Hightow-Weidman from UNC-Chapel Hill in recognition of World AIDS Day. The lecture was held on the UConn Storrs campus in November. Upcoming lecture details are available online. Dean Gladis Kersaint visited the Queen Rania Teacher Academy in Jordan as part of a follow-up to the implementation of a program modeled after UCAPP and designed to advance the leadership skills of Jordan’s public school principals. The program, which was launched in 2016, is offered through a partnership between the Neag School, QRTA, the University of Jordan, and Global Affairs Canada. See photos and read about her visit. Kersaint was also featured in University of Miami’s School of Education & Human Development’s ENGAGE e-newsletter. With the help of a $25,000 Digital Projects for the Public award from the National Endowment for the Humanities (NEH), researchers from the Neag School, UConn’s Digital Media and Design Department in the School of Fine Arts, and UConn Library’s Archives and Special Collections are working with colleagues across the globe to develop an immersive learning experience called Courtroom 600 that uses virtual reality and game design to bring to life archival materials from the Nuremberg Trials. Neag School faculty members involved in the project include Alan Marcus, Glenn Mitoma, and Stephen Slota. In recognition of the 70th anniversary of the Universal Declaration of Human Rights, the Neag School and UConn Today highlighted the range of human rights education efforts led by Glenn Mitoma, an assistant professor in the Neag School and director of the Thomas J. Dodd Research Center at UConn. Faculty and students in the Integrated Bachelors/Masters (IB/M) and Teacher Certification Program for College Graduates (TCPCG) programs gathered for a community-building networking event, followed by a film screening of and panel discussion about “Backpack Full of Cash,” an award-winning documentary that explores the growing privatization of public schools and the resulting impact on America’s most vulnerable children. The event was held on the UConn Storrs campus in November. Check out photos from the event here. Third-graders from Martin Elementary in Manchester, Conn., came to the UConn Storrs campus for insights about college. They were hosted by academic advisors Mia Hines and Dominique Battle-Dawson, who used a game to help discuss different career opportunities. The event, held in November, also featured student leader representatives from Leadership in Diversity (L.I.D. ), who talked about why they wanted to be teacher and about their journey to college. L.I.D. members included Jesús Cortés-Sanchez, Shanza Hussain, and Anne Denerville. See more photos from the event. Students in Neag School’s Teacher Education program participated in a joint history teaching session at the University of Nottingham during their study abroad experience this past fall. Neag School’s Department of Educational Leadership is one of seven universities that are part of the Wallace Foundation’s University Principal Preparation Initiative, a four-year, $48.5 million program aimed at improving training for aspiring administrators. The Foundation encourages administrator training that emphasizes the practical aspects of the job and includes instructors who have been school leaders themselves. UConn Today recently featured the initiative. 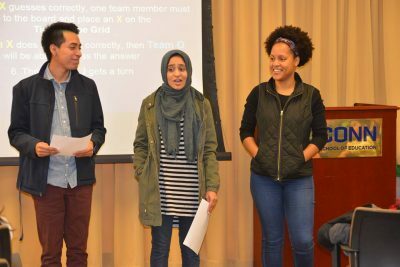 Higher Education and Student Affairs (HESA) first-year students enrolled in EDLR 5105: Structured Group Dialogue in Student Affairs hosted a gallery walk in November on the UConn Storrs campus. 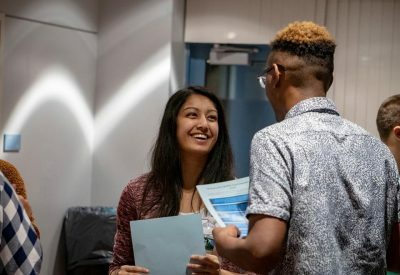 This culminating event for the course showcased student-created, interactive visuals regarding the need for and process of disrupting race talk within higher education contexts. Faculty and campus partners attended the event and engaged in dialogue with students regarding their visuals. Check out photos from the event. The sport management doctoral program was recognized in a review of programs in the U.S., based on scholarly indicators by Texas A&M’s Center for Sport Management Research and Education, for appearing in the top five in multiple categories. Gerardo Blanco, Milagros Castillo-Montoya, H. Kenny Nienhusser, and Kari Taylor made presentations at the Association for the Study of Higher Education (ASHE) Annual Conference in Tampa, Fla., in November. Laura Burton and Jennie Weiner, in partnership with the Connecticut Association of Public School Superintendents’ (CAPSS) Women in Leadership Committee, are participating in a seminar series during the 2018-19 academic year focused on the experiences, triumphs, and tribulations of female superintendents, assistant superintendents, and other district-level administrators. Burton and Weiner were also featured last month in the Department of Educational Leadership’s Research Series. 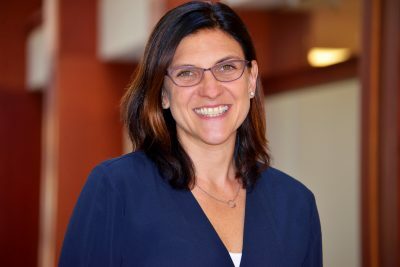 Jennie Weiner, assistant professor of educational leadership, will be honored in March as the recipient of the 2019 Dr. Perry A. Zirkel Distinguished Teaching Award. Laura Burton, Jennie Weiner, and Daron Cyr, a doctoral student in educational leadership, were awarded the 2019-20 Spencer Award for Small Studies to continue their work focused on how microaggressions impact the experiences of black female principals. Casey Cobb, Morgaen Donaldson, Richard Gonzales, and Sarah Woulfin made presentations at the University Council for Educational Administration (UCEA) Annual Convention in Houston in November. In addition, doctoral students in educational leadership also made presentations at UCEA, including Latanya Brandon, Chelsea Connery, Shannon Holder, Patricia Jahaly, Britney Jones, Sam Kamin, and Alex Lamb. 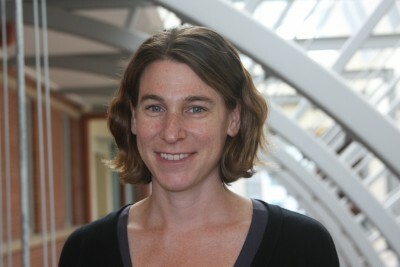 Jennie Weiner has been named the 2019 recipient of the Dr. Perry A. Zirkel Distinguished Teaching Award, which honors a faculty member in the Neag School for outstanding teaching. She will be formally recognized at the Neag School’s 2019 Alumni Awards Celebration in March. The Center for Behavioral Education and Research (CBER), which is housed in the Neag School of Education, hosted a Breakfast Brown Bag on the UConn Storrs campus in December featuring panelists from the Connecticut State Department of Education (CSDE) who spoke about the “Vision of Education in Connecticut: Opportunities, Challenges, and Advice for Future Leaders.” Panelists from the CSDE included Kim Wachtelhausen, consultant, talent office; Bryan Klimkiewicz, chief, bureau of special education; Charlene Russell-Tucker, chief operating officer; and Melissa Wlodarczyk Hickey, director of literacy/reading. Check out photos from the event. A study by the National Center for Research on Gifted Education on identifying English learners as gifted and talented was featured in the Language Magazine. Three Neag School individuals were recognized for their academic achievement by the National Association of Gifted and Talented’s annual in Washington, D.C., in November. 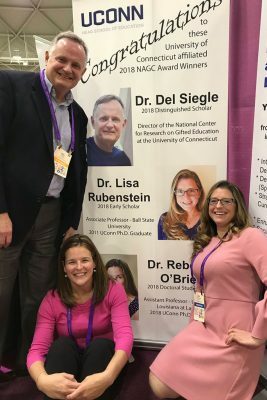 Del Siegle was recognized with the 2018 Distinguished Scholar award; also recognized were Neag School alums Lisa Rubenstein ’07 MA, ’11 Ph.D. with the 2018 Early Scholar award and Rebecca O’Brien ’18 Ph.D. with the 2018 Doctoral Student award. Catherine Little, E. Jean Gubbins, Sally Reis, and Joseph Renzulli and doctoral students Stacy Hayden and Anne Roberts, as well as research associate Rashea Hamilton also presented at the convention. Ronald Beghetto authored a book chapter titled “Unfreezing Creativity: A Dynamic Micro-longitudinal Approach” in the new volume Dynamic Perspectives on Creativity (Springer, 2019) and also co-wrote the introduction to the book. Gerardo Blanco was profiled on the Department of Educational Leadership website. Laura Burton’s article “Underrepresentation of Women in Sport Leadership: A Review of Research” was listed by the Sport Management Review journal as one of the most highly cited articles contributing to the journal’s 2017 two-year impact factor. Todd Campbell co-published with alum TJ McKenna ’18 Ph.D. and other authors “Negotiating Coherent Science Teacher Professional Learning Experiences Across a University and Partner School Settings” for the January issue of the Journal of Science Teacher Education and also co-published “Thick and Thin: Variations in Teacher Leader Identity” for the Fall 2018 issue of International Journal of Teacher Leadership. Earlier this month, he co-presented “Teen and Adult STEM Identification in Informal STEM Programming” with Laura Rodriguez ’16 (ED), ’17 MA as well as “Research Practice Partnerships and Design-Based Research: Supporting Coherent Pre-Serviceand In-Services Science Teacher Professional Learning” with McKenna and another colleague at the 2019 Association for Science Teacher Education Conference in Georgia. Rebecca A. Campbell-Montalvo was a guest speaker on the undercounting of indigenous Mexican students in Florida schools for UConn El Instituto on the UConn Storrs campus in November. She presented on “Raciolinguistic Repertoires in Chicanx and Latinx Lives” at the Society for Linguistic Anthropology meeting in November in San Jose, Calif., and also was awarded a $8,000 seed grant from the Collaboratory on School and Child Health to research “Healthcare Needs and Access for Connecticut Migrant and Seasonal Farmworker Schoolchildren” as part of a UConn team. Sandra Chafouleas has been selected to receive the Edward C. Marth Mentorship Award. 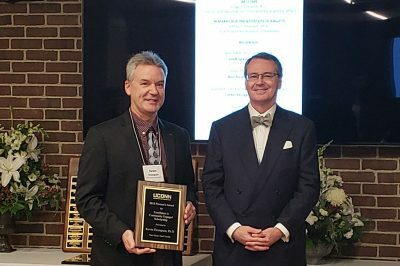 The award was established by the UConn American Association of University Professors (AAUP) to recognize the leadership and dedication of Edward Marth, former executive director of the UConn AAUP Chapter, and to encourage and reward outstanding mentoring of graduate students by UConn graduate faculty members. She will be formally recognized at UConn’s Doctoral Commencement ceremony in May. The American Athletic Conference (AAC)’s Academic Consortium has awarded Clewiston Challenger a $10K grant for a project on AAC student-athletes. Joseph Cooper is one of the co-investigators. Clewiston Challenger was awarded a $10,000 grant for a project titled “A Mixed Methods Exploratory Study of American Athletic Conference Student-Athletes’ Adjustment to College, Sense of Belonging, and Mental Health” from the American Athletic Conference’s Academic Consortium. Joseph Cooper is one of the co-investigators on the project. Casey Cobb served on the committee reviewing proposals for the new institutional host and editorial team for the Journal of Cases in Educational Leadership. Cobb was selected to join Education Sciences journal’s editorial board and was invited to serve on UCEA’s Program Centers Advisory Board for a three-year term. In addition, he was recently profiled on the Department of Educational Leadership website. Joseph Cooper was a panel participant on “Writing for The Conversation,” hosted by the UConn Collaboratory on School and Child Health, the Neag School, and UConn’s University Communications. The event was held on the UConn Storrs campus in November. 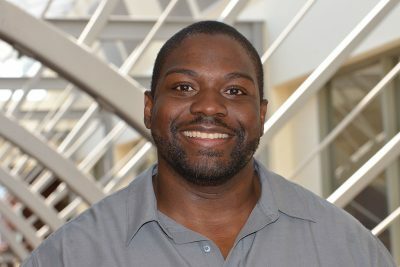 He also has published a new book From Exploitation Back to Empowerment: Black Male Holistic (Under)Development Through Sport and (Mis)Education (Peter Lang, 2019), which will be celebrated at a book launch event at 7 p.m. on Feb. 18 at the African American Cultural Center on the Storrs campus. 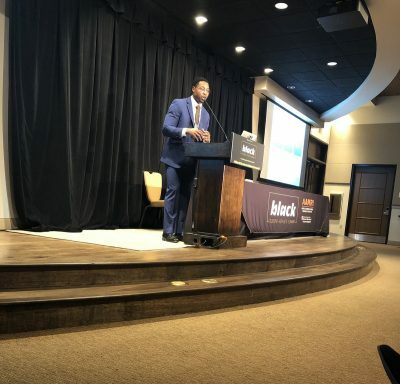 Cooper discussed the new book earlier this month at the 2019 Black Student-Athlete Summit at the University of Texas at Austin. Michael Coyne, along with doctoral students Cheryl Lyon and Victoria Whaley, presented at the National Center on Intensive Intervention conference in Washington, D.C., in January. Coyne also co-published “Implementing MTSS in Beginning Reading: Tools and Systems to Support Schools and Teachers” in Learning Disabilities Research and Practice’s January issue. Morgaen Donaldson and Sarah Woulfin’s co-published piece “From Tinkering to Going ‘Rogue’: How Principals Use Agency When Enacting New Teacher Evaluation Systems,” which originally appeared in the July issue of Educational Evaluation and Policy Analysis, was featured in the November issues of Marshall Memo and Georgetown University’s FutureEd newsletter. Donaldson was also featured this month in the Department of Educational Leadership’s Research Series. Robin Grenier published a blog post on the Graduate Certificate in College Instruction website about keeping course materials organized. In November, Grenier was in New York, N.Y., to take part as a member of the Fulbright National Screening Committee. She was also named chair of the Ad Hoc Committee on Academic Integrity for the Scholastic Standards Committee. In addition, she co-published a new book titled Qualitative Research in Practice (Jossey-Bass 2019). Preston Green served in November on a panel titled “Promises and Pitfalls of School Choice” at the Arkansas School of Law. A research paper he co-wrote on charter schools was also featured in Diane Ravitch’s blog. Joshua Hyman was a co-author of “The Long-Run Impacts of Same-Race Teachers” for the November issue of the National Bureau of Economic Research. The same report was featured in numerous media outlets nationwide, including Education Week, Atlanta Georgia News, CT Mirror, NPR, and UConn Today, and Inside Higher Ed. James Kaufman co-published “Does Intelligence Strengthen Creative Metacognition?” for the November issue of Psychology of Aesthetics Creativity and the Arts as well as “Advancing Creativity Theory and Research: A Socio-cultural Manifesto” in the January edition of The Journal of Creative Behavior. Devin M. Kearns co-published “Why Children With Dyslexia Struggle With Writing and How to Help Them” for the October issue of Language Speech and Hearing Services in Schools. He also co-published “Helping Students With Dyslexia Read Long Words: Using Syllables and Morphemes” for the December issue of Teaching Exceptional Children and “The Neurobiology of Dyslexia” for its January issue. Tamika La Salle published “International Perspectives of School Climate” for the November issue of School Psychology International. Catherine Little presented in November at the Virginia Association for the Gifted Seminar, held in Roanoke, Va.
Allison Lombardi was a co-author of “Facilitating College Supports to Ensure Student Success” for the December issue of New Directions for Adult and Continuing Education. In addition, Lombardi and Emily Tarconish, a doctoral student in the Neag School, received a Center for Excellence in Teaching and Learning) mini grant for their project “Assessing the Impact of Disability-Awareness Videos on Faculty Members’ Teaching Effectiveness.” Lombardi also served as a guest editor, with Neag School alum Lyman Dukes ’01 Ph.D., for the December issue of Career Development and Transition for Exceptional Individuals, in addition to co-authoring “Introduction to the Special Issue on Postsecondary Preparation for Students With Disabilities” in the issue. Milagros Castillo-Montoya was featured this month in the Department of Educational Leadership’s “Lessons From the Field” series. Jennie McGarry is the 2019 recipient of the Earle F. Zeigler Award. This is the North American Society for Sport Management’s most prestigious award, provided to a senior scholar in sport management. Bianca Montrosse-Moorhead co-presented and also served as a panelist, workshop leader, and conference session chair at 2018 American Evaluation Association Conference in Cleveland, Ohio, in November. Also in November, she presented a professional development workshop at UNICEF’s Evaluation Learning Day; watch the video of the workshop. Kenny Nienhusser co-published “Awakened Hatred and Heightened Fears: ‘The Trump Effect’ on the Lives of Mixed-Status Families” for the December issue of Cultural Studies – Critical Methodologies. 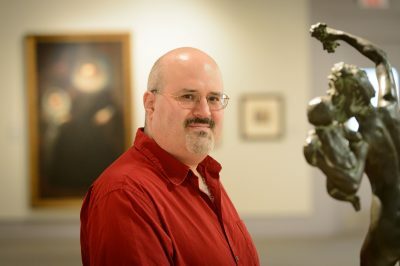 Christopher Rhoads has been selected to receive the first Baden-Württemberg and Connecticut Faculty Mobility Grant funded by the Ministry of Science, Research and the Arts. The grant will fund a trip to the University of Tubingen in March 2019, with the purpose of encouraging collaboration between researchers at the University of Tubingen and the Neag School. Del Siegle published “Seeing is Believing: Using Virtual and Augmented Reality to Enhance Student Learning” for the December issue of Gifted Child Today. Noam Sturm, PK-3 Leadership Program instructor, was profiled on the Department of Educational Leadership website. Michael Young served as an advisor to the Electronic Gaming Federation Fall 2018 Connecticut State Championships. One of his doctoral students, Andrew Cochran, is focusing his dissertation on support for e-sports coaches. 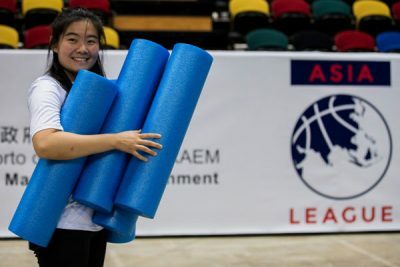 Three students in the sport management program, Dike Wei, Ivy Kim, Enbo Liu, each having roots in various parts of China, gained professional experience through an internship with Asia League, a startup basketball company in China. Katrina Camerato, a second-year student in the HESA program, along with fellow group members, recently placed first in the Northeast Association of College and University Housing Officers new professionals case study competition, held in December at Bentley University in Waltham, Mass. Katrina Camerato, Jessica Gramajo, Patrick Rogers, and Alessa Strelecki, second-year students in the HESA program, presented their assessment project, “Definitions and Descriptions of High-Impact Practices in Extra Curricular Experiences at UConn,” at the 2018 National Association for Campus Activities Northeast regional conference, held in Hartford, Conn., in November. Graduate students Dandan Chen, Dakota Cintron, and Brittany Hernandez presented at 2018 American Evaluation Association Conference in Cleveland, Ohio, in November. Bianca Montrosse-Moorhead served as chair of the conference session and as co-author for several of the presentation research papers. Robert Cotto, a doctoral student in educational leadership and director of Urban Educational Initiatives at Trinity College (Conn.), is serving on Governor-Elect Ned Lamont’s Education Policy Transition Committee. Graduate student Caroline Galeota penned an op-ed published in Education Week on twice-exceptional students. Shannon Holder, a doctoral student in educational leadership, is the co-host of a new podcast on iTunes, titled The Hidden Curriculum, through University Council for Educational Administration (UCEA)’s graduate student council. The podcast focuses on topics in educational policy, leadership, and administration. Isabella Horan, a senior in the elementary education program, has been selected to receive the Alma Exley Scholarship. She will be formally recognized in May at a ceremony in Hartford, Conn.
Scott Hurwitz, a doctoral student in educational leadership, defended his Ed.D. capstone project on the UConn Storrs campus in January. He shared findings on principals’ framing of anti-bullying policies, and explained how and why administrators enacted these polices in various ways in their school buildings. Blair Izard, a doctoral student in curriculum and instruction, co-authored with David Moss a book chapter titled “Raising the Bar: Landing Your First Academic Position in U.S. Higher Education” in the volume Achieving Academic Promotion (Emerald Publishing, 2019). 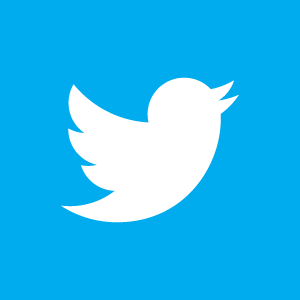 Kristi Kaeppel, a doctoral student in educational leadership, co-presented “GIFs, Twitter, Docs, Oh My! 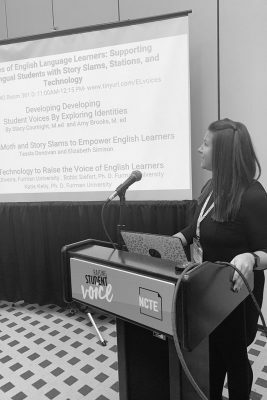 Eliciting Unheard Voices with Technology” in October at the Magna Teaching with Technology Conference held in St. Louis, Ill. The topic was also published in the December issue of Faculty Focus. Sam Kamin, a doctoral student in educational leadership, co-presented “Measuring Program Characteristics, Experiences and Quality in New York City’s Career and Technical Education System” at the Association for Public Policy Analysis and Management’s fall research conference in November in Washington, D.C.
Donald “DJ” McAulay, a doctoral student in educational leadership, presented at the Black Student-Athlete Summit at the University of Texas at Austin in January. William Corey Moore ’18 (BUS), a current HESA student, gave a TedxUConn talk last spring titled “Black Boys: Passing the Blueprint” that is now available on YouTube. Patricia O’Rourke, a fourth-year doctoral student in curriculum and instruction, was awarded a grant from the UConn Humanities Institute’s Initiative on Campus Dialogues Fellowship Program. 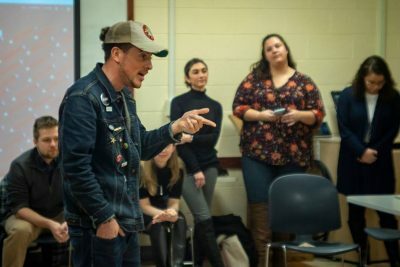 The project included a hosted visit and performance at the UConn Storrs campus in December by Epic Theatre Ensemble, whose mission is to create bold work with and for diverse communities that promotes vital discourse and social change. The group of high school students is on a tour that includes universities, local and state policymaking groups, and a scheduled appearance in the presidential address of the AERA 2019 Annual Conference. Kayla Pardue, a music education major, was featured in a UConn School of Fine Arts video about her student experiences. Damayanti “Dami” Rane-Castrodad was awarded a UConn Leadership Legacy Award, which recognizes the University’s most exceptional student leaders by inviting them to participate in a yearlong leadership enhancement experience that is immersive, comprehensive, substantive, and that builds on their legacy as University leaders and helps prepare them for a life of commitment and contribution beyond graduation. Emily Tarconish, a doctoral student in educational psychology, is featured in this month’s edition of “10 Questions,” where she shares her insights on her journey to a Ph.D. program in the wake of a traumatic brain injury she endured at the age of 15. Read about educational psychology Ph.D. student Emily Tarconish in this month’s “10 Questions,” where she shares her insights on her journey to a Ph.D. program in the wake of a traumatic brain injury she endured in her teens. 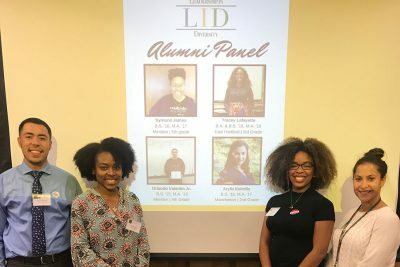 Student group Leadership in Diversity hosted an alumni panel on the UConn Storrs campus in November featuring alumni Symone James ’16 (ED), ’17 MA; Tracey-Ann Lafayette ’15 (ED), ’16 MA; Orlando Valentin Jr. ’15 (ED), ’16 MA; and Aryliz (Crespo) Estrella ’16 (ED), ’17 MA, who spoke about their experiences in teaching. Alan Addley, ’07 ELP, ’14 Ed.D., superintendent for Granby (Conn.) Public Schools, was recognized as Connecticut’s 2018 Superintendent of the Year by the Connecticut Association of Public School Superintendents. Ryan Baldassari ’16 MA was quoted in a recent UConn Today article on Olympic athlete and UConn student Donn Cabral. Alumni Michelle Buyer ’15 (ED), ’16 MA; Emily Chassagnoux ’17 (ED), ’18 (MA); Gregory Knight ’16 (ED), ’17 MA; Benjamin Mason ’16 (ED), ’17 MA; James Ray ’17 (ED), ’18 MA; Melissa Scarbrough ’15 (ED), ’16 MA; Sara Smith ’12 (ED), ’13 MA; Rex Sturdevant ’17 (ED), ’18 MA; Lianne Torres ’17 (ED), ’18 MA; and Justis Lopez ’14 (ED), ’15 MA took part in a panel discussion featuring during a Teacher Leadership class led by Michele Femc-Bagwell in December. Current students Stephanie Consoli ’18 (ED), ’19 MA and Elizabeth Swan ’18 (CLAS), ’19 MA moderated. See more photos from the event. Catherine Carbone ’15 Ed.D. was appointed superintendent of Bristol (Conn.) Public Schools, starting July 1. She most recently served as the assistant superintendent. Abby L. Chien ’14 MA has been named Director of Diversity and Equity Center at Central Washington University. Emma Cohen ’06 (ED) was featured in the November edition of the Collegiate Event and Facility Management Membership Spotlight. William Collins ’05 Ed.D. was appointed superintendent of Ridgefield (Conn.) Public Schools. He previously served as the superintendent of Newington (Conn.) Public Schools. Walter Diaz ’92 MA, vice president for student affairs at Eastern Connecticut State University, was recognized with the Connecticut Association of Latinos in Higher Education’s Lifetime Achievement Award. Caroline Doty ’12 (ED) was inducted into the Germantown Academy Hall of Fame in Fort Washington, Pa., in November. Doty was a three-sport student-athlete at UConn. She currently works for Nike in Oregon and coaches an eighth-grade girls’ basketball team. Melissa (Moeckel) Ellenberger ’99 (SFA, ED) is the newest educator to attain National Board Certification in District 49 on the east side of Colorado Springs, Colo. She is one of five in the Colorado Springs area to obtain certification this year and one of four statewide to obtain certification in music. Chelsea Gamble ’14 MA was named head coach for University of Oregon’s Women’s lacrosse team. Prior to her new role, she was the offensive coordinator for Stanford University’s Women’s lacrosse team. 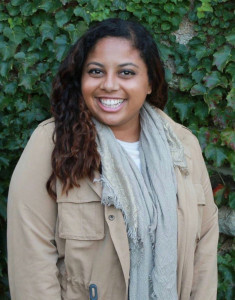 Monique Golden ’15 MA received the NASPA Region 1 Outstanding Graduate Student Award at the 2018 NASPA Region 1 conference, which was held in Providence, R.I.
Jill Griswold ’15 (CLAS), ’16 MA, currently a Spanish teacher at South Windsor (Conn.) High School, had her workshop selected as “Best of Conference” for the 2018 fall Connecticut Council of Language Teacher’s (CT-COLT) conference. Carl R. Johnson ’03 (ED), ’04 MA, ’15 6thYear was appointed principal of Plainville (Conn.) High School, where he previously served as the assistant principal. Kimberly Lawless ’94 MA, ’96 Ph.D. and Scott Brown co-wrote “Promoting Global Perspectives in Students,” a book chapter in More Like Life Itself: Simulations as Powerful and Purposeful Social Studies (Information Age, 2019). Susan Lubomski ’17 ELP was recently appointed interim superintendent for Torrington (Conn.) Public Schools. Ralph Mayo ’06 ELP was elected to the board of directors at the Community Centers Inc. of Greenwich in Greenwich, Conn. Faith McCarthy ’17 (ED), ’18 MS hosted an espnW Campus Conversation at the UConn Storrs campus in November, during which sport management students and athletes took part in conversations with Jamelle Elliot ’96 (BUS), ’97 MA associate athletic director, National C Club, UConn; and other former student-athletes. Pamela Muraca ’04 ELP was appointed as interim superintendent for Newington (Conn.) Public Schools. Laurie Pallin ’16 ELP was appointed interim superintendent for Montville (Conn.) Public Schools. 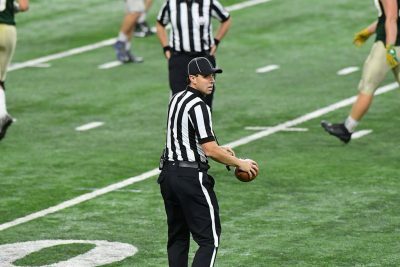 Justin Paluch’12 (BUS, ED) was selected to officiate the Michigan High School Athletic Association Division 6 State Football Final this season. He also officiates DII college football and DI, DII, and DIII women’s basketball. Jodi Roth-Saks’08 Ma was appointed executive director at the Jewish Relief Agency in Philadelphia. Elizabeth Simison ’04 (CLAS), ’08 MA and Tessla Donovan ’15 (CLAS), ’17 MA presented at the National Council of Teachers of English’s national conference in Houston in November. The presentation was based on a summery program they built for Miss Porter’s School, based in Farmington, Conn.
Kevin Thompson ’13 Ph.D. was recognized with the UConn Provost Award for Engaged Scholarship. Thompson is an assistant professor-in-residence at UConn’s School of Business, where he teaches human capital courses in the Human Resources Management graduate program and at the undergraduate level, as well as the strategy capstone course for undergraduate business students. Umesh Vig ’04 MA was promoted to director of international student affairs and student conduct at Manchester Community College (MCC) in Manchester, Conn. He was previously assistant to the dean of student affairs, since joining MCC in 2004. Elease E. Wright ’76 (ED), former chief human resources officer at Aetna, was named to Governor-elect Ned Lamont’s transition panel.